Smith and Oakley are two of the most renowned brands of ski goggles. In the following article, we are going to discuss the comparisons between their popular models, Smith IO and Oakley Airbrake. There are several factors that need to be considered in choosing between these two models, such as your available budget, design preference, and whether you need to replace your lenses quite frequently or not. 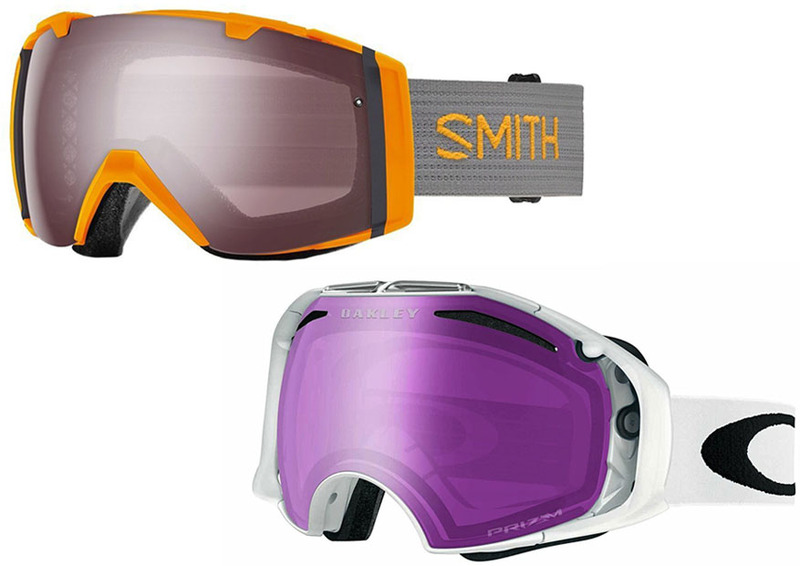 We will guide you in choosing between Smith IO vs Oakley Airbrake below, so continue reading! As a matter of fact, both Smith IO and Oakley Airbrake come with interchangeable lens mechanisms. However, Oakley Airbrake holds the better edge here, as the lens system is indeed very quick and efficient. All you need to do to change its lens is pull the switch, remove the lens and put in the other one, and put back the switch to the original position. It is very simple, easy, and quick. Smith IO’s lens changing process is also easy to understand, but takes a little bit more time to accomplish. We have also discussed about Oakley Airbrake vs Flight Deck XM. Make sure that you check it out! Both Smith IO and Oakley Airbrake are compact. However, Smith IO is the more compact one of the two. It has a nicely streamlined design. Although the lens is surrounded by the rim, the rim is thin, not too bulky. The more compact design also allows the goggle to fit more easily in different helmets. On the other hand, Oakley Airbrake is a little bit bigger. The outriggers are bulky. Some people hate the outriggers. The bulkier design may make it a little bit tricky to fit into some helmets. But, if it fits in your helmet and you are not bothered by the outriggers, why not? Both the Smith goggle and the Oakley goggle are very comfortable to wear. There is no issue regarding their comfort. Smith IO features the Carbonic-X outer lens material which is individually molded for optimum resistance against scratches and impacts. On the other hand, Oakley Airbrake features the flexible O Matter faceplate which is able to perfectly conform to your face for the best fit and comfort. So, how does the field of view of Smith IO vs Oakley Airbrake compare? Truth to be told, they perform quite similarly. The Smith IO is slightly narrower, but the difference is not significant. On the good side, the streamlined rim allows you to get more peripheral vision. On the other hand, Oakley Airbrake has a slightly larger lens, so the field of view is supposedly wider. However, the bulky outriggers will limit your peripheral vision. Smith IO has a more affordable price, but you will only get one lens. You will need to purchase the other lenses separately to adapt to different conditions and benefit from interchangeable lens system. On the other hand, Oakley Airbrake is more expensive, but it comes with two lenses that are designed for bright light and low light conditions. If you don’t mind the thick outriggers, Oakley Airbrake is more recommended. It has a very quick and efficient lens changing mechanism, and it comes with two lenses. Smith IO can be your choice if you prefer a more streamlined design, but note that the bundle only includes one lens.